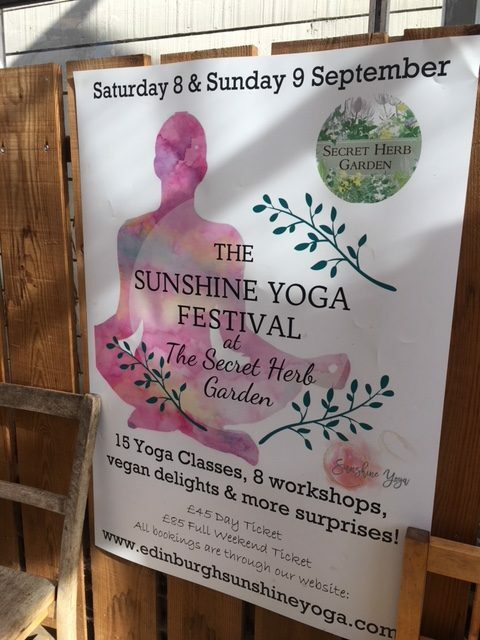 This past weekend we went to the wonderful city of Edinburgh to partake in Sunshine Yoga’s yearly festival held at the magical Secret Herb Garden just outside of the city, nestled in the Pentland Hills. Celebrating mindful living, and bringing together over 15 yoga classes across a variety of styles as well as 8 unique workshops throughout the weekend to help you find your inner self and find some peace in our everyday world. The weekend was all about connecting with nature, exploring new ideas and making new friends, everyone was so welcoming and kind. Their generous spirit enhanced with the peaceful surroundings, you felt at once at home and with old friends. 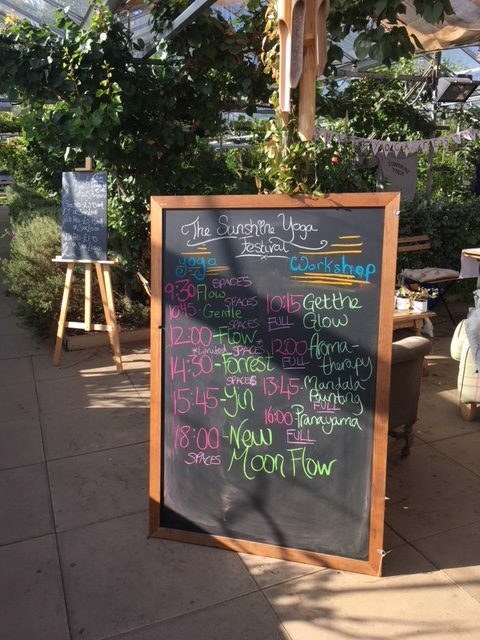 Whether you wanted to challenge yourself physically or tune in to calm and do inner work, Sunshine Yoga offered a class or workshop on the schedule to suit your needs. With 10 different variations of yoga, you were able to completely immerse yourself in the magical, invigorating and sometimes relaxing style that suited your body on that day. Trying new forms, making time for yourself and learning through the journey of the movement of your body and your breath, the classes were taken by experienced and thoughtful teachers, allowing you to find your own groove as you moved from one position to the other. On the Sunday we practised Flow Yoga and Yin Yoga, one of which we know well, the other not so well. Flow was taught by Matt, who along with his wife Stephanie run Sunshine Yoga. 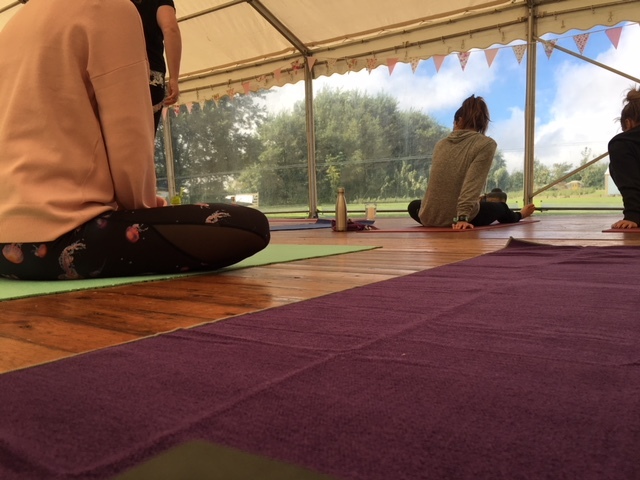 The hour flew by in the quickest of moments, but we felt relaxed and rejuvenated and practising yoga in a tent akin to the Great British Bake Off tent, along with the Scottish winds whipping at the sides of the tent was simply electrifying. Looking out towards the Pentland Hills as we flowed into our downward dogs and chaturanga, you felt at one with nature, feeling the energy of the wind through your body pushing you further and deeper into poses. Yin was taken by Alice, and was a complete new experience to us. Working on our meridian lines, we spent the hour opening our hips to target the specific meridian line of our stomach and spleen. Meridians are considered channels where Qi or Prana flows. Qi is the basic life force of the body and having enough flowing smoothly in the meridians is key to health and longevity in body and mind. Yin focuses on releasing the deepest tissues of you body and improving energy, rather than working on your muscles, it allows your ligaments to stretch and elongate. You hold the stretches for 3 – 5 minutes, which takes a great deal of concentration, and determination to keep going. As a beginner to Yin, it can feel strange not to move, to flow, to come out of the position and into another straight away, but stay with it because it can be deeply emotional as well as help you have some time for quiet, something we don’t get enough of. We attended to lovely workshops throughout the day, Get the Glow and Mandala Painting. 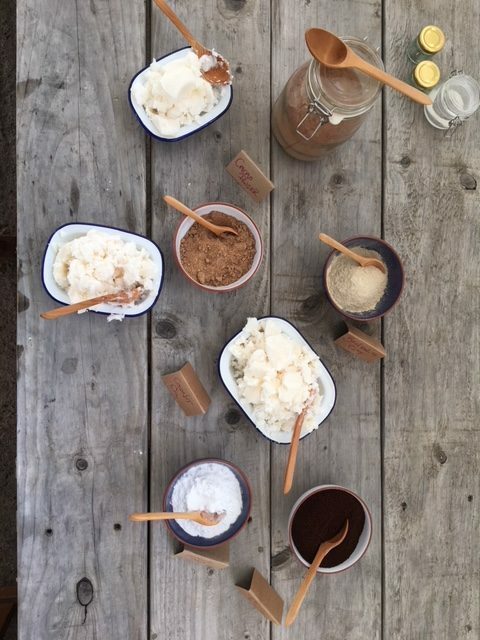 Get the Glow taught us how to make our own face moisturiser, toothpaste and clay mask, all packaged in reusable glass containers for us to reuse and make the products again once we had used them. With coconut oil as the base, the toothpaste and moisturiser are completely vegan, as was the clay mask. DIY beauty is such an exciting yet completely easy and simple process, and was a fabulous opportunity to bond with others around the table. 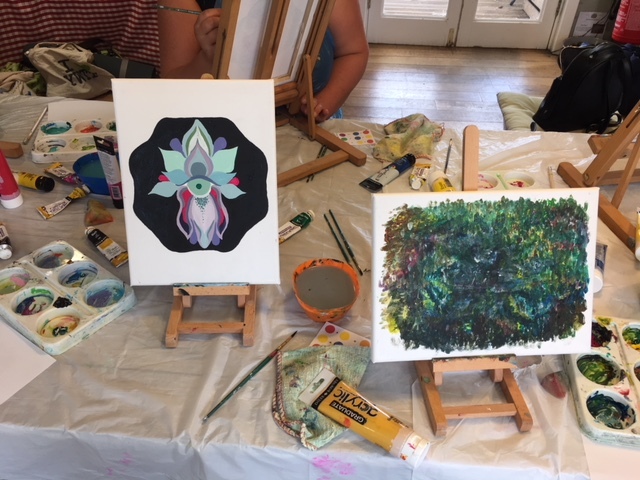 Mandala painting, however allowed us to really tune into ourselves, paint for fun and actively allow time to be quiet, or talk, giving us permission to play with paint. Everyones artwork was different, their interpretation a visual representation of their feelings, and it was quite euphoric to paint and not worry about the end product. The Secret Herb Garden is set on an amazing piece of land, with a cafe and huge glasshouses to explore. 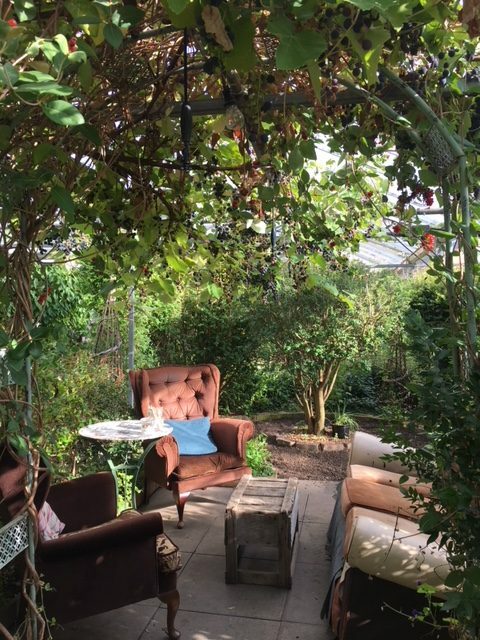 Amongst the herbs and plants, heavy boughs of grapes and pears hang from the ceilings of the glasshouse, as you walk around admiring all of the wonderful plants, you can find a secret hideaway to sit, reflect and enjoy a slice of vegan cake or a delicious bowl of their soup. On the estate they also grow all of their own botanicals for their own gin – a perfect little pressie to yourself to take home!